Wonky Wheel | Rule 1: Don't think. Just write it down. It is exceedingly pleasing to bring in this bounty in late November. A few weeks ago we attended the funeral of Jeanne Hollis McDowell, the mother of our friend Steve. We went because although we didn’t know her well, we liked her and Steve and Kathy are our dear friends. All four people who spoke – Steve, Jeanne’s granddaughters Erin and Sarah, and the minister, Judy, who had known Jeanne since childhood, were eloquent about her life. We knew her as a woman with an inquisitive and optimistic look on her face and a bright interest in the world and its inhabitants. The speakers at the service clarified and expanded upon her character as a kind, compassionate, and open-hearted person. I had a little epiphany during the funeral. Like many people, sometimes I fall into a pit of despair for no good reason. In those times I tend to think that my life has no value to anyone or anything. I’ve never finished the novels I’ve started, my dissertation was an uninteresting molehill, I’ve never stuck with anything, I have nothing to say, blah blah blah. The epiphany came from the wonderful descriptions of Jeanne’s life. She wasn’t Mother Teresa or president of the United States, didn’t write the Great American novel or run a soup kitchen (that I know of). Yet her way of being in the world was of enormous value to the people who knew her. She was a marvelous mother and grandmother, a woman who cared about people and home and community, and that was enough. My point here isn’t about who I am, nor about who Jeanne was. It’s that living a compassionate life and being present and open-hearted are all we need to do. Sadie had a bad week last week. She started dragging her back legs, and was unable to come up the steps from outside. So on Friday, we said goodbye to her. Our wonderful vets, one of whom was responsible for getting her picked up after she was hit by the car 3 years ago and the other of whom did the surgery to put her pelvis back together, came out here on their lunch hour. We all sat out on the grass on Sadie’s crate blanket, and with Buster, who lay quietly beside us. While the vets were preparing, a great blue heron flew low overhead, directly above us. Sadie whipped her head around – she was always an optimistic chaser of big birds, “Maybe this time I can catch it!” – and then laid it back on Rick’s lap. We think she had a glimpse of the goodness of her afterlife, deeply deserved. I haven’t posted in a long time on this blog. Egghead Junior just requested that I do so, and I do have something to say. In February of 2010, when I was running out of steam on posting here, we got Sadie, and I wrote about her a couple of times. She is the sweetest doofus of a dog. We adore her, and now we’re going to lose her. She has a tumor in her right shoulder that will likely metastasize into her lungs. Because of the steel plates holding her pelvis together, she has a funny peg-leg way of running, and so we probably didn’t notice that she was limping on her front leg until last Thursday. We saw it in the morning, and in the afternoon when I took the dogs for their walk she was really struggling. But she’s a game dog, always up for whatever’s happening, so she was trying. I cut the walk short. We thought she must have hurt her leg jumping off the porch on last week. The next morning A took her to the vet, where they x-rayed her and saw the tumor. Apparently it is not unusual for animals who have endured some sort of trauma (like being hit by a car) to get this kind of tumor. The day after that, the dogs saw a coyote out in the field below the house and as usual went bananas. A and I at first hesitated to let them out, but then we thought, what the heck, why take away the thrilling experience of being a dog from her? She and Buster went tearing out in the normal way, Buster out front, Sadie gamely lolloping along behind. This time she ran out of steam partway down the field. She stood for a few moments, her head low between her shoulders. And then she laid down. A and I watched from the house in sorrow. Then he walked out to get her, prepared to carry her back if necessary. She saw her favorite person coming and got up to meet him. She’s on pain medication, which seems to be making her comfortable, better today than yesterday. We’re going to do our very best to prevent her from being in pain. We always wait just a tad too long to make the difficult decision to put our pets down, and we’d like to avoid that this time. We have been able to give her a second window on life, and she has given us great joy. I’m really annoyed by Hy-Vee, Hefty bags, and mostly, myself. A couple of days ago I was in the express checkout line (12 items or less) at Hy-Vee, buying cherries, grapes, lemons, and blueberries. 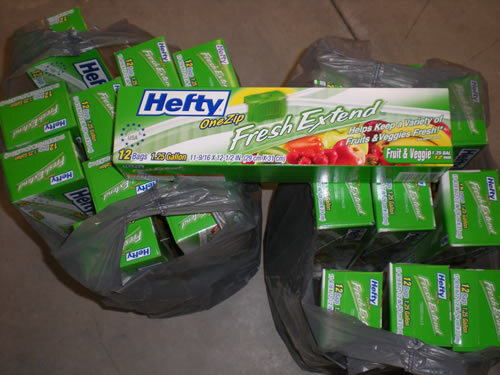 The checker said “You have $20 worth of produce, and so you are entitled to 20 free boxes of these bags.” She waved her hand at a grocery cart beside her, filled with boxes of Hefty plastic bags. You know I hate plastic and never take my groceries in plastic bags. But it’s garden season, and I freeze lots of tomatoes, green beans, etc. So I thought, well, okay, I can use those. As the checker toiled away at the cash register, I noticed a) that there was a pallet of cartons of plastic bag boxes behind her, and b) that these weren’t plastic bags I could use to freeze vegetables. They’re that kind of bag you’re supposed to keep produce in, to keep it fresh longer. I recently read an article that said that these bags don’t keep produce any fresher than washing it and wrapping it in a dishtowel. I didn’t have the presence of mind to stop the checker partway through her endeavors (or maybe I was just chicken, yeah, that’s it) to tell her to forget it. I have absolutely no use for 240 plastic bags (12 per box) that can’t be used in the freezer. Any ideas what I can do with them? I thought about giving them to Just Food, the people who coordinate the food pantries in town, as well as the distribution of Plant a Row for the Hungry vegetables. I might do that, but really, they’re useless! Just more non-biodegradable detritus for the landfill. Why, oh why, did I take them? Oh yeah, and she put the boxes in plastic bags too. I'm reeling. Sadie (aka Smudge for her pig-pen-like characteristics) went out tonight below the retaining wall and immediately got skunked. Wow. Peeeeeeee-yewwwwwww. It was raining and so Buster the big wuss did not get off the porch, thank goodness. Mix the hydrogen peroxide, baking soda and dish soap in a large bowl and stir until the baking soda is completely dissolved. Next, use a spray bottle or sponge to generously apply the mixture onto the pet’s fur. Work the mixture through the fur and onto the skin below, massaging the solution into the affected area for ten minutes. Be cautious when applying this solution to the face, as the mixture should not come in contact with the eyes. After ten minutes has passed, thoroughly rinse the solution from the animal’s fur and skin. Once the solution is completely rinsed away (there should be no soap bubbles remaining in the water as it flows off the body), towel the pet’s fur. If the odor is still relatively strong and skunky, repeat the above-mentioned steps. If the odor is largely eliminated, then continue on to the next step. Once the solution of hydrogen peroxide, dish soap and baking soda has been rinsed away, use a sponge or spray bottle to apply generous amounts of vinegar to the pet’s damp fur and skin. Again, saturate the fur and massage the solution into the fur and skin. After letting the solution sit for twenty minutes, thoroughly rinse the pet with fresh water. Often, the pet is left smelling vaguely of vinegar. To leave your pet smelling fresh and clean, follow with a gentle pet shampoo and conditioner. Frankly, I couldn’t care less if my pet is left smelling vaguely of vinegar. It beats the heck out of skunk.